Ton and Jack are two students who’re infamous for making video clips in which they challenge and even insult superstitious beliefs. As their viral clips rack up more and more views, they escalate the intensity of their pranks. They get carried away and become reckless: their plan is to kidnap Tor, Ton’s younger brother, and bring him into a cemetery as a revenge for something he’s done to Bee, a woman whom Jack is in love with. Ton and Jack carry out their plan. They take Tor into the cemetery and are about to handcuff him to a corpse. When the two pranksters find a dried-up skeleton, they notice a shiny coin in its mouth. Ton gets greedy and takes the coin away – suddenly, the corpse stirs. Ton is frightened and as he starts running, he sprains his ankle and collapses to the ground. Tor is shocked and about to run away too, but at that moment Ton handcuffs his brother’s hand with his own. Together, they run away as the vengeful ghost chase after them. All hell breaks loose. Ton and Tor are forced to flee in the dark, as Jack and other friends run in different directions. But what all of them will find later is a real nightmare they’ll never forget – if they can make it out of the cemetery alive. I have to admit this is one of the most scary horror films I’ve watched thus far. While the ones I’ve watched previously were both funny and scary, this film is scary, scary and scary. I won’t really spoil the film by providing too many spoilers, so this review will be giving you only glimpse of what happened in the movie. There’s two groups of characters in the story, the group of students who went to play in the cemetery and the group of people (the monk, his father, the monk’s lover and some villagers) they met after taking the gold coin. The director brought the audience straight into the set by showing how Tor walked across a forest himself, while others watch the whole process via the video conference. I could almost feel the chill running down my spine as I watch the opening scene, anticipating, yet fearing what would happen to the boy. What made “Ghost Coins” different from other horror film was the use of karma, past lives and reincarnation. I had expected the typical teenagers’ reckless offending of spirits and they get punished for their greed in the end. But the film had a nice twist, which made me can’t help but hold my breathe as I waited to see what happened to the characters. This film actually made me think a lot, about how the relationships one has in this lifetime can be related to the past. And of course, that if you are innocent, you will be blessed in some way! I will say it’s a definite must-watch for all horror-film lovers! The director of Ghost Coins is Tiwa Moeithaisong. He became popular because of the horror film “The Sisters”. His film “Bangkok Love Story” also won the top prize – the Grand Award in all Categories at the 34th Brussels International Independent Film Festival. It was also the Opening Night selection for the 2007 Hong Kong Lesbian and Gay Film Festival, and played at the 2008 London Lesbian and Gay Film Festival. The final car crash scene where Ton and Tor was submerged in the water, was filmed in a swimming pool. The main character Ton was acted by singer Dharmthai Plangsilp (also known as Timethai). He was discovered in 2010 by Kamikaze’s casting staff who came across Timethai’s videos on a YouTube channel named ‘Dharmthai’. His debut singles music video in December 2011 of “No More” on YouTube has reached more than 10,000,000 views within just 5 months and have been discussed nationwide. Check out Ghost Coins เกมส์ปลุกผี Facebook Page! 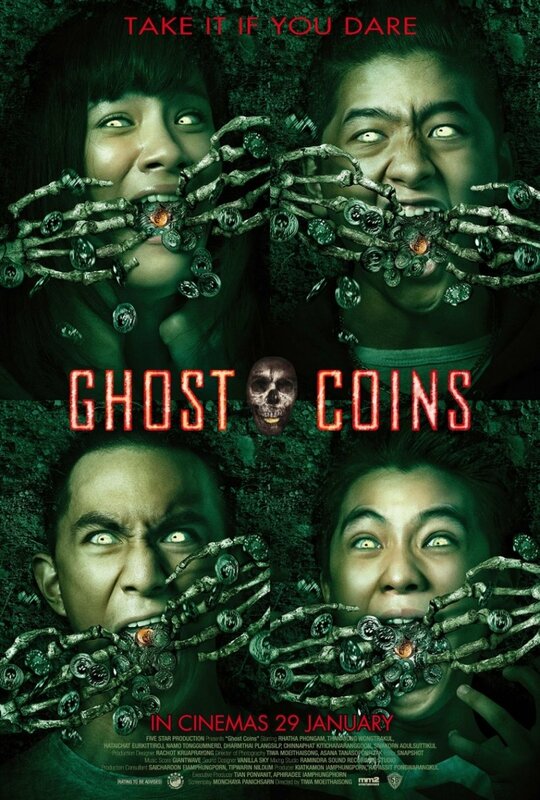 Ghost Coins เกมส์ปลุกผี is out in cinemas on 29 January 2015.
this is a horrible movie.wasted 1.5 hrs in theatre…sd habe spend the time shopping instead. Haha, why do you find it bad? all the horror was kept until the last 15 minutes of the movie. the first one hour of the movie was just thai drama of a pretty girl getting upset and the guy comforting her. I felt so empty after watching this movie. No wonder lah its PG13 only. Kiddy horror. If you’re a horror fan, than stay away from this movie – waste of money. If you’ve been watching romantic comedy and want to try a bit of horror – than this movie is perfect for you. The horror content is 5%. Judging by the photos and your review the movie is scary and exciting to watch so I would love to give it a try, moreover, the movie is directed by the award-winning director of “The Sisters”! I wonder if they will show this Thai film here? Thai films have a chance to get shown here but i havent seen this one in cinemas yet. Karma is a common theme in horror films. Where do you live? I’m in USA and have same problem. I will skip this horror movie because i m too scared to watch it. Is this Thai horror movie? I swear I will never ever watch any from Thailand. It is more horrible than others. Well, but I know my dear will be interested. I’ve seen a couple of Thai horror films and I can attest Thai directors are good in doing one. This one seems a nice film to watch. OMG! another thai horro movie!!!! i love thai horror movies. i think they make the best nowadays. long gone the days of japanese and korean horror movies and knowing that they have the same director as the bangkok series, i will definitely watch this! thank you!!!!!!!!! Trailer looks really scary. Will try to watch this when it become available. This looks really scary and also looks like it has a lot of light moments. This would be a nice movie to watch. Oh oh I am afraid of Horror/Thriller/Suspense story. Base on your review, it is the scariest movie you’ve seen, so i guess I need someone to be with me if i watch this. Another horror film? Hmm.. yet to watch this but your review seems like an interesting movie. Haha, elana, I get invites to watch a lot of horror films, somehow!